We're also leaving the Mac App Store. Flinto 23 is only available from Flinto.com. We're also announcing a new pricing model for Flinto for Mac licenses. Magic Swatch When you have a color value in your clipboard, like #FF6759 or hsba(5,65,100,100) an extra swatch will magically appear with that color value. Quick-Add Swatch When you activate the eyedropper, hold shift and click to immediately add a swatch with the sampled color. It's great for quickly loading in a set of colors. It's fast! You may not think of a color picker needing to be fast, but when things like activating the eyedropper and dragging the color values have even a small delay, it can really get in the way. We've changed the underlying technology for our wireless live preview. It's faster to connect and more reliable. Make sure to update the iOS viewer app in order to use live preview in Flinto 23. We're now using the popular Sparkle update system so this is the last time you'll have to download a .dmg file and copy it to your applications folder. You're probably wondering why we didn't do this sooner, right? We weren't comfortable using Sparkle because of a security feature it was lacking. That feature has been added, so now we're on-board. We've released 10 free major updates to Flinto for Mac since launch including today's release of version 23. Today Flinto for Mac is also changing to a yearly license model. When you buy a Flinto for Mac license, you will receive one year of free updates. If you bought Flinto for Mac more than a year ago, you receive today's version 23 release for free, and will need to purchase a new license if you wish to upgrade to Flinto 24 when it is released. When your license expires, Flinto keeps working. You only need to buy a new license to upgrade to the next version that is released after your license expires. This licensing model has proven succesful for other design tools such as Sketch. It encourages us to release regular updates without holding back features for large upgrade releases. We think it's the most fair option for our customers and for us. Flinto for Mac is no longer available through the Mac App Store. If you've previously used Flinto from the Mac App Store, this version will prompt you with instructions to migrate over and we will issue you a free license key. Read our blog post for more information. Flinto for Mac version 1.5 is available now. To celebrate, we’ve reset all the free trials. If you’ve tried Flinto for Mac in the past, you should give it another shot because we’ve made a lot of updates! Download it from the Flinto for Mac website. Flinto for Mac now supports vector rectangle shapes. You can draw rectangles directly in Flinto, and rectangles in Sketch will import as actual rectangles rather than bitmaps. Having rectangle shapes in Flinto for Mac means you can smoothly animate properties such as corner radius, fill color, border and shadow. This opens up tons of new possibilities. 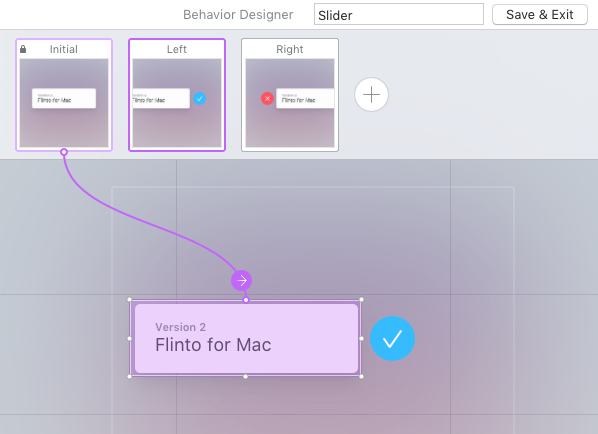 This means you can quickly draw simple layouts right in Flinto for Mac. Draw rectangles directly in Flinto for Mac. Adjust new properties that weren't previously available in Flinto for Mac. 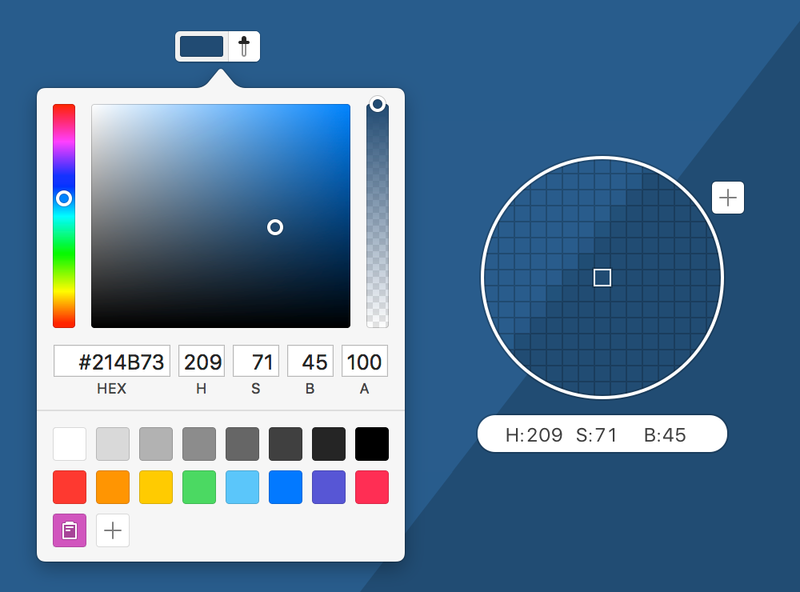 Adjust properties like border, color, shadow and corner radius. And by animating the new properties, you can do really nice effects. Try connecting two different rectangles for smooth transitions of color, shape, drop shadow etc. Animate all the rectangle properties for awesome effects! You can now attach sounds to gestures in Flinto for Mac! Just drag a sound file onto a gesture in the sidebar and it will be played when the gesture is activated. This adds a new dimensions of realism to your prototypes. UI sounds are so fun! Easily add sounds to your designs with drag and drop. The Sketch plugin now sends rectangles and circles to Flinto as vector shapes when possible. As long as the rectangle has a single border, a single solid fill and a single drop shadow, it will import as a vector rectangle layer in Flinto for Mac. Circles are imported as rectangles with a corner radius that makes ‘em circular. The plugin also sends the artboard's background color to Flinto as a rectangle layer. Lastly, we’ve added a handy progress bar to show import progress. Sometimes you apply a bouncy spring to a layer that fades in and moves across the screen. It looks great that the layer bounces, but usually you don’t want the opacity to bounce also. Disabling opacity bounce prevents an ugly opacity flicker. Certain properties tend to look really wrong when they bounce, so we’ve disabled repeated bouncing for opacity, color, shadow, border width and corner radius. We added a convenient transition manager sheet where you can see a list of all your transitions. 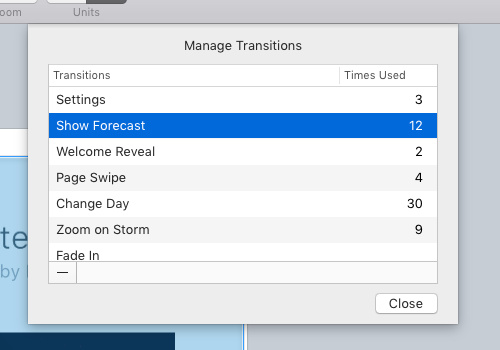 Access it in the Edit menu under "Manage Transitions". When you create a new document, Flinto chooses a much smarter zoom level so you can see your screens at as close to 100% as your screen will comfortably allow. Flinto for Mac is now localized in simplified Chinese. Remember, we’ve reset all the trials, so you have no excuse not to give Flinto for mac a look. This is a really big update and we’ve added so much since we first launched, so there’s never been a better time to dive in. Have you ever had an idea that seemed good, but you wouldn’t be sure until you were able to try it out? Designers face this conundrum frequently when deciding how a software feature should work. If you don’t face this challenge, you’re either a genius, or you mistakenly think you are. Unless you are all-knowing, you will come upon ideas that seem like they will work, but you can’t really tell until you know how it feels to use it. Since software development is expensive, you may hesitate to propose such ideas unless you are certain they will work out. This is one of the reasons prototyping is valuable, you can try lots of things quickly and refine the ones that work. Prototyping interactions using Flinto for Mac will let you test lots of interaction ideas before a software engineer ever sees them. Prototypes answer questions like, “Will this look weird if it animates?”, “Will it feel more natural for this to be a swipe gesture”, “Is there any reason not to shrink this photo?”. Testing those questions on your own through prototyping will give you confidence of their efficacy when proposing ideas to your team. And you’ll have a demo to back it up. Industrial designers have a bigger barrier to creating products than those of us designing software. It’s not possible to build hardware, notice something wrong and then tweak it. Industrial designers build countless models to get a feel for their design before having the final product built. 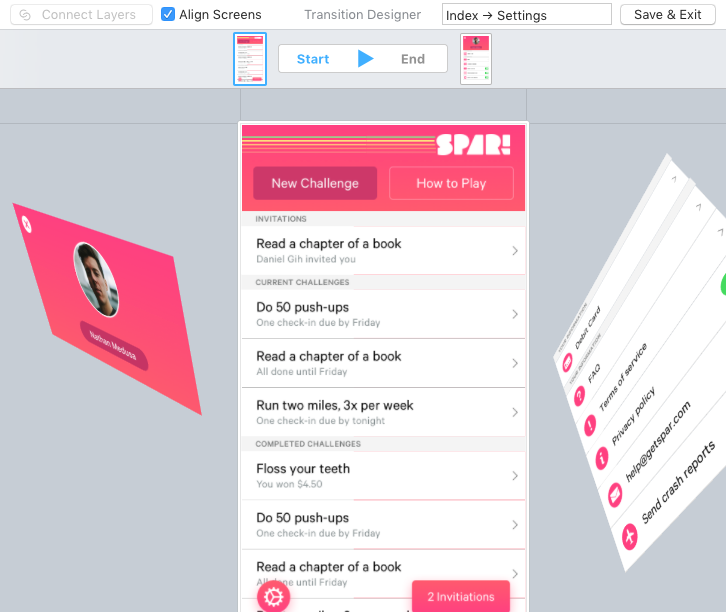 Software designers are gaining the ability to do the same thing thanks to prototyping tools like Flinto for Mac. Our hope is that you’ll use Flinto for Mac to try 10,000 things, and maybe a few of them will be brilliant ideas you wouldn’t have proposed otherwise.